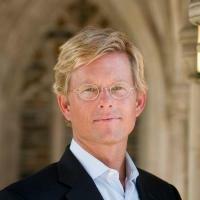 C. Kavin Rowe is Professor of New Testament at Duke University Divinity School. His most recent book is One True Life: the Stoics and Early Christians as Rival Traditions (Yale University Press, 2016). He is the author of two other books: World Upside Down: Reading Acts in the Graeco-Roman Age (Oxford University Press, 2009, paperback 2010), and Early Narrative Christology (de Gruyter, 2006, repr. Baker Academic, 2009). He has published multiple scholarly articles and co-edited The Word Leaps the Gap (Eerdmans, 2008) and Rethinking the Unity and Reception of Luke and Acts (University of South Carolina Press, 2010). He is on the editorial board of several international peer-review journals and has also frequently written articles for faithandleadership.com. Rowe has been a Fulbright Scholar, Regional Scholar for the Society of Biblical Literature, chair of the Society’s Southeastern Region New Testament section, president of the Society's Southeastern Region, and was elected to the Studiorum Novi Testamenti Societas. He was awarded a Lilly Faculty Fellowship, a Christian Faith and Life Grant from the Louisville Institute, the John Templeton Prize for Theological Promise, the Paul J. Achtemeier Award, and a Distinguished Scholars grant from the McDonald Agape Foundation.